Click image to enlarge Coffin Rock, Oregon, as seen from the Kalama shore, Washington. View from the Kalama Sportsman's Club. Image taken April 14, 2013. Coffin Rock is on the Oregon side of the Columbia River at River Mile (RM) 73, approximately one mile downstream of Goble and upstream of the Trojan Nuclear Facility. On the Washington side of the Columbia River downstream lies Mount Coffin, often confused with Coffin Rock. 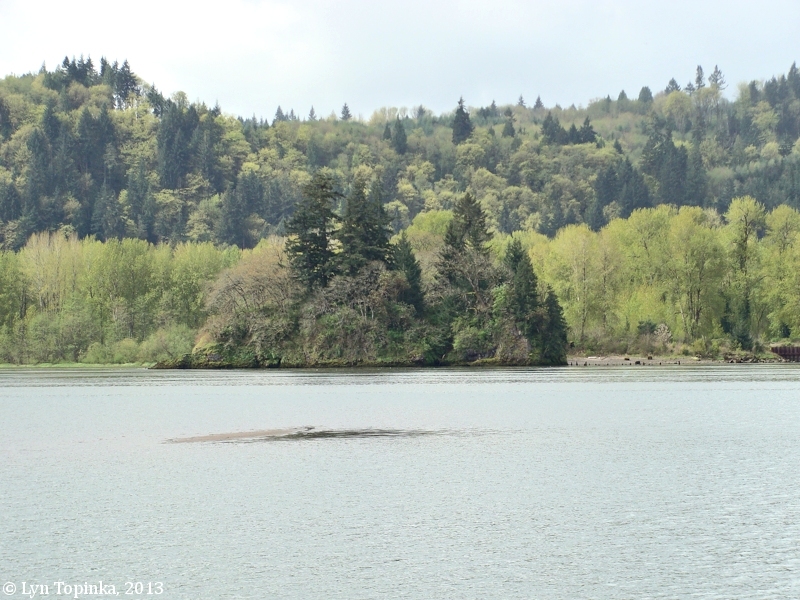 Lewis and Clark make no mention of Coffin Rock. In 1792 Lieutenant Broughton of the Captain George Vancouver Expedition, mentions Coffin Rock, calling it a "small rocky islet". In 1805 and 1806 Lewis and Clark pass the area of Coffin Rock but make no mention of it. According to McArthur and McArthur in Oregon Geographic Names (2003) the first use of the name "Coffin Rock" was January 11, 1814, by Coues in the Henry-Thompson Journals. The 1825 map of the Hudson's Bay Company called "Columbia River, Surveyed 1825" (printed 1826), called the rock "Corpse Rock". In 1841 Charles Wilkes of the U.S. Exploring Expedition uses the "Coffin Rock" name. Alexander Ross in 1849 writes about Mount Coffin and Coffin Rock from a journey in 1811. While he calls Mount Coffin both Mount Coffin and Coffin Rock, he leaves todays Coffin Rock unnamed. On December 27, 1889, a collision between the British ship Clan Mackenzie and the steamer Oregon occurred near "Coffin Rock Light", when the steamer mistook the light from the Clan Mackenzie to be the Coffin Rock Light. The collision occured a mile upstream of the Coffin Rock Light and resulted in the sinking of the Clan Mackenzie and the loss of two of her crew. A suit was filed against the Oregon on December 31, 1889. Then, on April 5, 1890, the Oregon Short Line & Utah Northern Railway Company, charterer of the Oregon, filed a cross-suit against the Clan Mackenzie, charging that the collision was the fault of the British ship for "failing to display a proper anchor light, to keep a proper anchor watch, or to call the steamer's attention by shouting, ringing the ship's bell, or showing a lantern or torch, as required by Rev. St. 4234". The case went all the way to the U.S. Supreme Court. "... immediately below said Coffin Rock, and a short distance inside of it, on the face of a wooded promontory, and at a height of about thirty feet from the water, there is and was at said time maintained a government light, described as a tubular-lens lantern of a one hundred candle power, with a radiating power of four miles, and easily visible on a dark, clear night from three to four miles. ..."